My philosophy and strong belief is that the organ is probably the most exciting instrument a child can have access to and play. I have during the last 13 years offered special organ lessons for young people, from 6 years old, and I teach them technique, theory, reading music and so on. Perhaps students should play the piano for some years before starting the organ. The question still remains: what do we do when pianists do not want to convert to organ playing, or if they do, do not want to play for church services, only in concerts? Moreover, who am I to deny a challenge to a child who just wants to play the organ because it looks fun and exciting? In my mind, there are a few points one should consider before starting an organ school. These apply to both to the parents and to the students themselves. Inform the local church, and the local newspaper/media. Ask: Why do young people want to play the organ? How and where they can practice? Is there a piano at home? Is there a church (with a suitable organ) available for practicing? Are basic teaching materials known and available? Can elementary organ knowledge be given, and if so, by whom? How can the students prepare themselves between before the lessons? (Here follows a discussion of the expectations of the involved parties). Let the children play on the pedals! When I started teaching the organ, I allowed my pupils to just play music for manuals only. One day a boy asked me, “When can I play on the pedals”? I said nothing at the time, but understood him well. I then started a process which led me to what I call the trio for children, where the bass part is easy, and the voices for the manuals are composed is, that they mirror each other. I asked earlier today “why do young people want to play the organ?” It’s because of the sound. And when you play full organ with hands and feet, they become happy and feel that they can do anything, even this, and they want to play more. Besides, because an old kind man made us special raised pedal blocks which may be attached to individual pedal keys, they are able to play with pedals from the first lesson. In fact, boys and girls who are 6 to 8 years old, start with pedals from their first lessons. I can tell that when I started, I tried to find a style of music who was a kind of universal. My believe is that those who gain such experiences at an early age are better equipped for later challenges. Let me talk about playing hymns. If you have a student who can’t read music, and you wonder what you should teach first, you can always start with a hymn! It’s important to me that whoever I am teaching, everyone learns to play hymns at all levels. 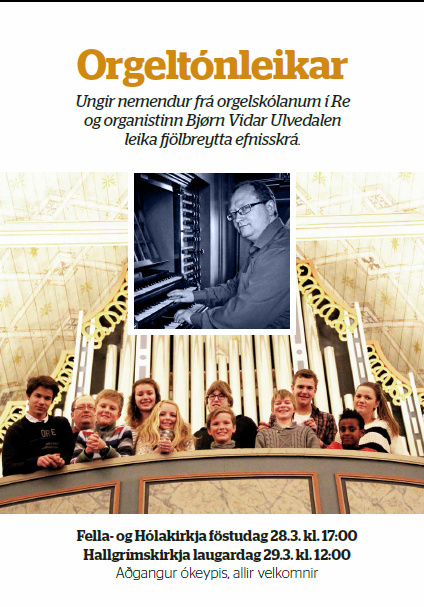 In Scandinavia, the organ is still the most important and most used instrument in the ceremonies in church. 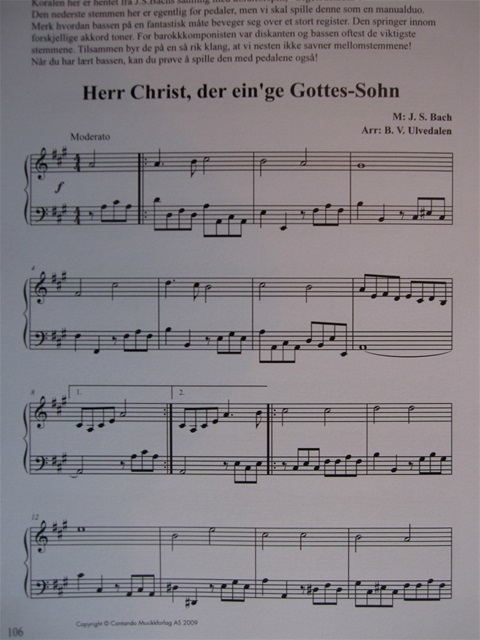 This is connected to the use of hymns in church, and consequent need of having the players skilled and able to play hymns, and not only being able to play organ repertoire. Based on my experience I have concluded that four-voice chorales require a form of intellectual awareness that youngsters develop first at the age of 16-18. I have reached this conclusion because it is at this age the motoric skills and ability to read the scores are successfully combined. This will, of course, vary widely from individual to individual. 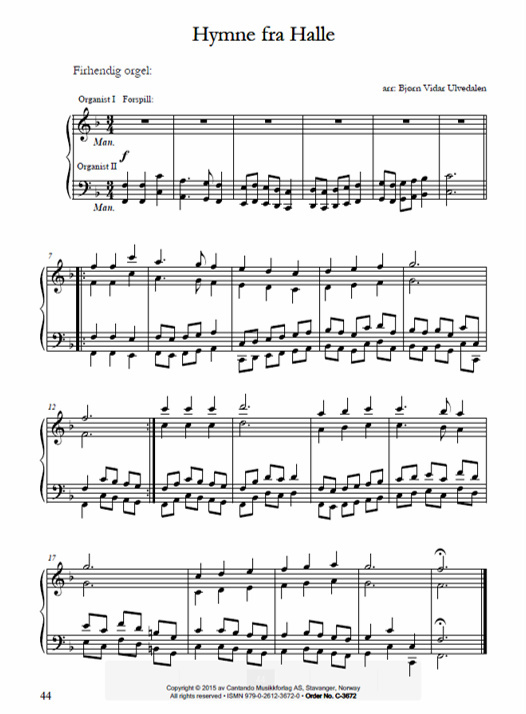 However, as we all know, it`s up to the player how the four voices should be divided between left and right hands and feet. This is often quite complex and difficult, so I usually arrange hymns as a trio that is with one part at each hand and the pedals. In this way, the student also gets a better understanding and knowledge of the melody and its structure and form. Interplay practice, between the congregation, the leader and the listener. A process of inculturation, where behaviour is influenced through knowledge of our common cultural heritage. An introduction to the art of practicing organ registration according to the text. As we know, to lead the congregation through service playing requires the development of leadership skills. One must be a leader and listen at the same time. This is the opposite to solo playing. It is very important that the conditions for playing the hymns are established in a fun and passionate way. I often meet technically well-developed students capable of playing challenging solo pieces, who do not show the same skills and ability when it comes to a “simple” hymn! This is one reason why I see this aspect of organ playing as important to musical development. Playing hymns gives the opportunity to teach improvisation, both through the chorale prelude and in the accompaniment of the various verses. Hymns also allow for the inclusion of small doses of information about the church, such as rituals, ceremonies and the church year: Christmas, Easter, Pentecost, weddings, baptisms, and funerals all have their own requirements. Strategic decision may be thereby made to introduce different styles and forms through the year, according to the calendar and the individual lives of the students. Finally, the chorale as a whole is undertaken! To introduce Bach’s music to the young organist may be a difficult task, but it is also a very exciting task. I think the d minor toccata for a lot of people is their excuse to begin to play the pipe organ. As professional organists we are perhaps a little bit tired of this piece. “Oh no! Not that toccata again!” There is an upside though: which other instrument has such famous piece which people automatically associate with it? I use the situation as a blessing as long as it open doors. 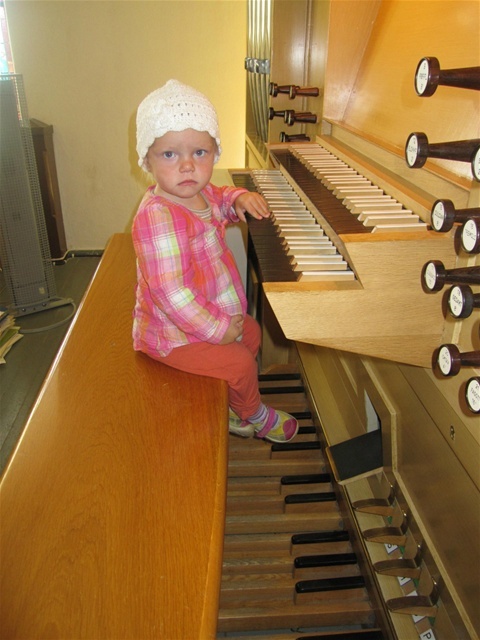 Is there a ideal time for the introduction of Bach’s music to young organists? Of course there probably is, but I’d like to tell you about my way of teaching Bach and other advanced music. We can always just let them play the scores. Piano teachers all over the world are well known for introducing all kind of musicworks which are “made playable”. 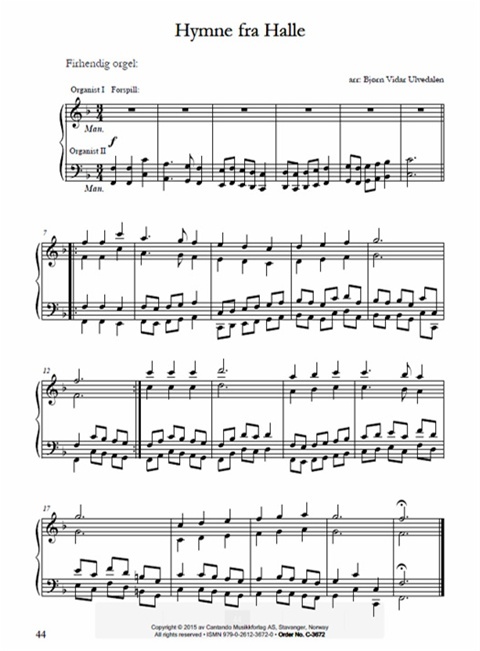 In books for young pianists one always finds simplified masterpieces. It is not so easy to find this kind simplification for organ lessons. Perhaps the classical organ music tradition remains a little bit to sacred to us, so that doing it in a simplified way is not a theme: “you have to wait until you are old enough!”. I do not necessarily disagree with this, but instead of providing my pupils with easy or nonsensical music, I prefer to give them a taste of quality. I have listened to a lot of children clarify how they understand music, and I believe that they are longing for good music. I also see that their parents appear more interested in helping their children to practice when they recognize the music and also feel that this is good music. So, I retain an open mind, and have provided several pieces “made playable” in my books. It is after all possible to play a lot of baroque music with just bass and soprano parts. And as teachers, we also can use this simplified works as preparatory works to the original. The pupil plays the treble part solo, with right hand, or left hand, or with both hands in octaves. The teacher plays the other voices. The pupil may play just the bass and soprano parts. 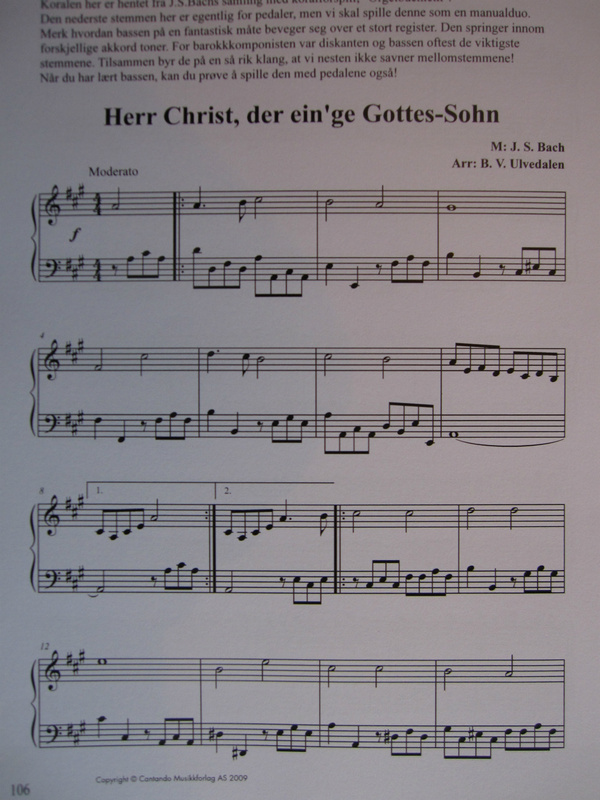 A lot of Bach chorales are excellent for such practice. Two or more organists can also share parts of the pieces. Bachs Invention no.8, in F major. Eight short, the preludes only. I give each of my ten young organists one hour lessons every week. In the first part of the lessons (30 minutes), they are studying and practicing for themselves. They use my office, where there is a piano, a desk, and available water and tasty fruit or cookies. They all have their own workbooks, where they can find practical exercises made specially for them. This means that I have to be very well prepared. Despite this, I find it very useful. In this way, they learn early to study by themselves. And this works well for the youngest too. When one leaves the desk to go to the organ, another take over. When the pupils arrive in the organ gallery to have their lesson, we spend some minutes talking about the results of their work on my desk. After this experience I created a standard program: The master plays an opening piece. Then the program is continued by my pupils. A simple but effective and amusing thing happened when the last of my pupils played a prelude by Bach, and the master continued directly on and played the fugue. These concerts have become very popular with a broad range of people and attract large audiences. A new culture has been established in Scandinavia. Several organ clubs have been established for promoting organ playing and teaching for children and young adults. 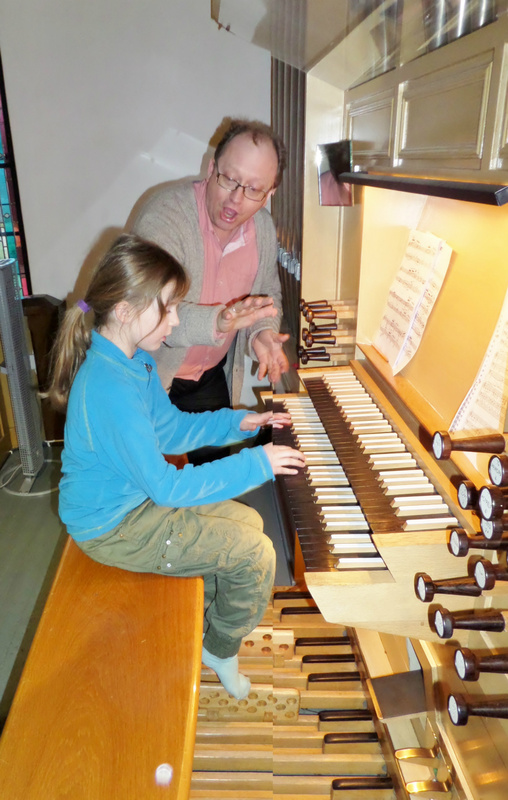 I do not know whether the work I am doing in teaching the organ to children will lead to a greater number of organists in the future. But I do know that more people have come to enjoy the organ and its music, and that is not a bad result at all! A new generation may look back upon a childhood with organ lessons and concerts in church. They have many memories of the fine musicians they have played together with. I believe children has rights! Rights to play the organ! Not only see or hear it. Rights to get knowing the old and rich culture of european cultur, the church, the church music, and the church musician, by playing. Let the children play the organ! In addition to giving organ lessons, I also take my pupils to orchestral and other concerts at concert halls. I do this in order that they become aware of “real” music, and learn to love it, rather than just the music from computer games. Two years ago we went to a concert where Beethoven’s third symphony was performed. They enjoyed the music, and the rather strange conductor; he reminded them of Mr. Bean! Suddenly one of the girls asked whether Beethoven wrote more symphonies. What about the famous “Destiny symphony”? And she started to sing the well-known main theme. At that time I was a running low on new ideas for my organ pupils; she had given me a great idea! When might we listen to Beethoven again? This was to become an expensive idea. Later that evening, when I went home, I googled to find out where in Europe the next performance of the fifth symphony would be performed. Guess where? Four months later I brought ten young organists with me to Reykjavik, the capital of Iceland, and to the famous concert house Harpa. 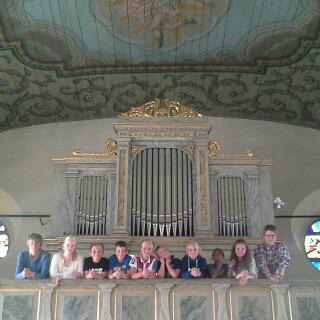 We also offered a short course for the local organists and played concert in Halgrim’s church. My pupils give me many ideas, and together we experience the world.